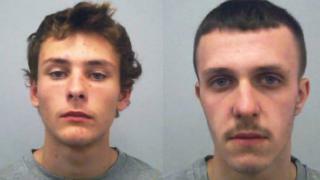 A teenage murderer has been jailed for 16 years for stabbing an unarmed man he did not know. Zachary Lemonnier, 18, killed Ronnie Wrighting, 29, as he waited for a taxi in Milton Keynes on 11 August. Co-defendant Robert Williams, 18, was convicted of manslaughter and sentenced to six years. Jailing them, Judge Andrew Bright QC said Mr Wrighting was a "big man, but he was no match for two young men armed with weapons". During a three-week trial, Luton Crown Court heard that Mr Wrighting had been attacked by the pair after arguing with Lemonnier. The jury heard that Mr Wrighting, who had been drinking, was waiting in Duparc Close for a taxi from his ex-girlfriend's home at about 22:15 GMT when Lemonnier, of Leadenhall, arrived on a moped. After the two men exchanged words, Lemonnier fetched a kitchen knife from Williams's home in Tallis Lane, Browns Wood. Williams took a baseball bat. During the attack - in which the two "rained blow after blow on him" - Mr Wrighting suffered a stab wound 16cm (6ins) deep which severed major blood vessels and his kidney was "almost cut in half", said prosecutor Martin Mulgrew. Mr Wrighting did not realise how seriously injured he was and by the time the taxi had taken him to Great Linford, he struggled to get out. Internal bleeding caused a cardiac arrest and he died in Milton Keynes Hospital the next day. Mr Wrighting's mother Zoe O'Neill, in a victim personal impact statement, said: "I cannot begin to describe the immense pain I feel every day. "We did not even get the chance to say goodbye. That night changed all our lives for ever."